Hi! My name is Susan LaCroix and I am Julie's guest blogger today. I am also her mom! Living so far away from each other, we don't get to stamp together too often but when we do, we have lots of fun! I just know that Julie and Jim are having a blast on their cruise! 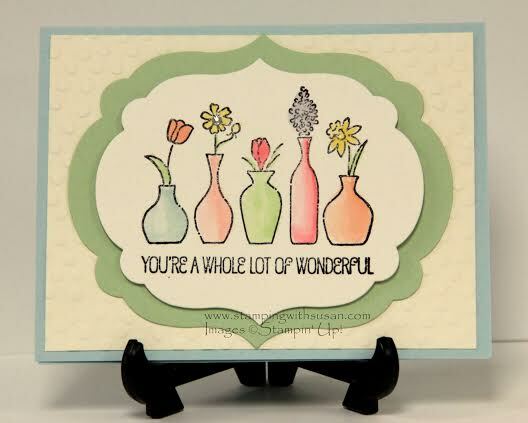 When Julie asked me to guest blog, it didn't take me long to pick a technique - right now my favorite thing to do is watercolor, so I can't wait until my Blendabilities Markers arrive! But in the meantime, my Aquapainter and ink pads work just great! Start with a layer of light color. After it dries, add darker tones or colors to shade and highlight your image.